When they come here, what we are looking for them to do is step up to the plate, take responsibility and get the big innings, the centuries – or take a lead with the ball. We are looking to get counties to play their young England players earlier, and the first reports from the counties are that it is working well. It also helps us to prepare in a better fashion. In 2004, we had a great year, with Samit Patel, Liam Plunkett, Tim Bresnan, Luke Wright, Alistair Cook. Some groups are not quite as strong. Equally, though, there are guys who play England Under 19 who don’t even play First Class cricket. It is a watershed in the careers in many ways. Andy Pick is a former English cricketer, and is the former coach of the England Under-19 team and the Canadian national team. 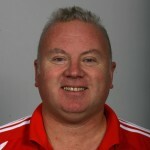 He is currently the ICC High Performance Manager for the Americas Region. An express-pace bowler, Pick played county cricket for Nottinghamshire. He made a somewhat inauspicious first-class debut against Hampshire in July 1983, returning first-innings figures of 20-3-101-0. During this match he also made his List A debut in the John Player League, taking 1-56 from eight overs, his victim being Mark Nicholas. Pick had a better 1984 season, taking 25 wickets at an average of a shade under 31, and from then until 1995 he was a regular in the Nottinghamshire first team, amassing almost 750 wickets in all forms of the game. In 1994, Pick hit his highest first-class score of 65 not out - batting at number ten - against Northamptonshire, but by this time his playing days were numbered, and his last appearances came in the 1997 season.